This notice is way in advance, but I’m very excited about offering a Mass this August for Ranchers, Farmers and Families. As many of you know, one of my joys of being a bishop is serving as the President of Catholic Rural Life, an organization dedicated to promoting the Church’s teachings on behalf of agriculture, care of the environment, and supporting the Catholic Church in Rural America. 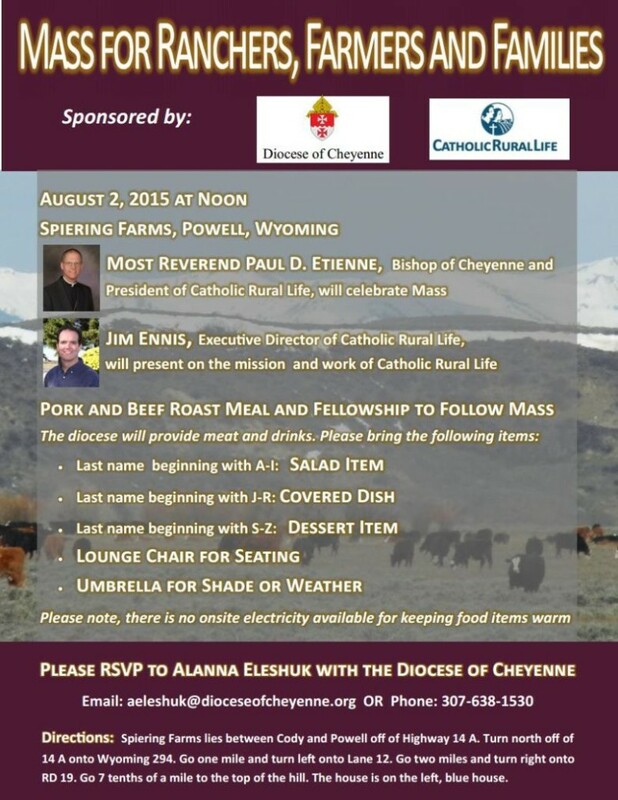 In August, The Diocese of Cheyenne will be happy to host Mr. Jim Ennis, the Executive Director for Catholic Rural Life. Jim will be present for the Mass in Powell and also give a presentation on the mission and ministry of Catholic Rural Life. It will be a perfect day to promote the work of Catholic Rural Life as well as to give thanks for another year of God’s blessings upon our flocks, herds, fields and families. Please make your reservation to attend now and help promote this event!